Sikhism is a young religion founded in the 15th Century with followers mainly in India and Pakistan. 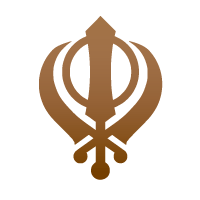 The principal belief of Sikhism is faith in waheguru – represented using the sacred symbol of ik ōaṅkār, the Universal God. The special Sikh religous symbol is made up of three images: The Khanda, which is a double edged sword. This represents the belief in one God. The Chakkar, like the Kara it is a circle representing God without beginning or end and reminding Sikhs to remain within the rule of God. Two crossed kirpans representing spiritual authority and political power.